Often the younger kids at the school I work at forget /loose a mitten or two. Just as often they only have one pair of thin gloves that just don’t dry out by second recess. So I’m using my odd balls of yarn to make mittens (and some scarves). Our mascot is the Lion. I’m making mittens to keep those little paws warm! I found a nice basic pattern that I’ve used as inspiration. 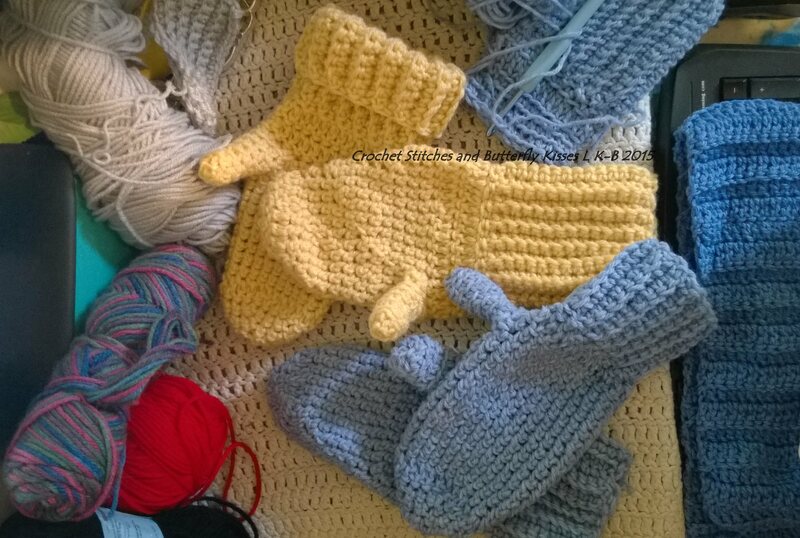 The kids I’m making mittens for are 7 – 10 yrs, so in the pattern the children’s is too small and the ladies is too big. I have small hands so I’ve been just using my hand as a measurement and …well… eye balling it from there. What I really liked about this pattern was the idea of a longer cuff. Playing in the snow is much more fun when your mitten is securely tucked in your sleeve and no snow gets in. At the moment I only had this light blue one. It would have been better with a different colour for this mitten. I only had that one left 😦 they are like bobby pins and socks…. they mysteriously disappear! 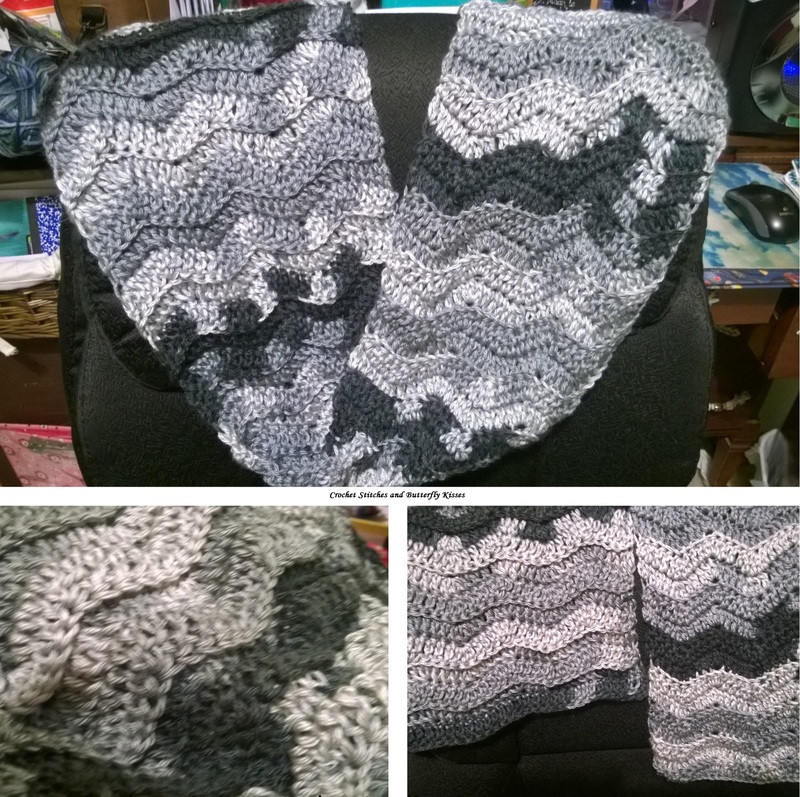 I finally made a scarf for my hubby. 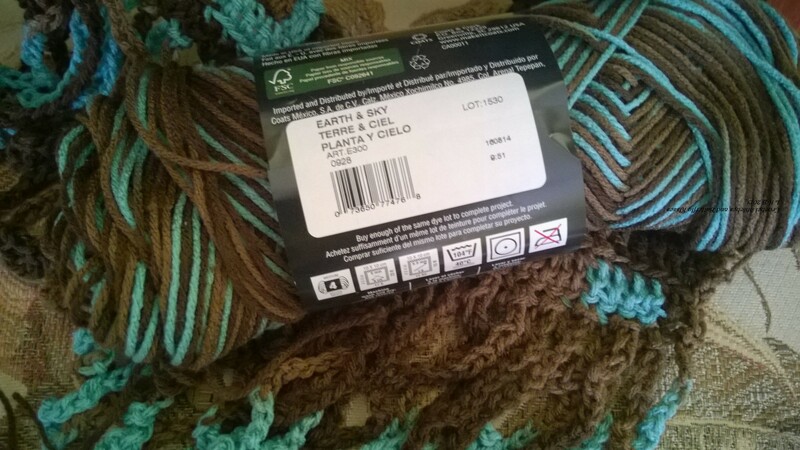 When I was buying the yarn for his the beautiful green yarn just “fell” into my cart. 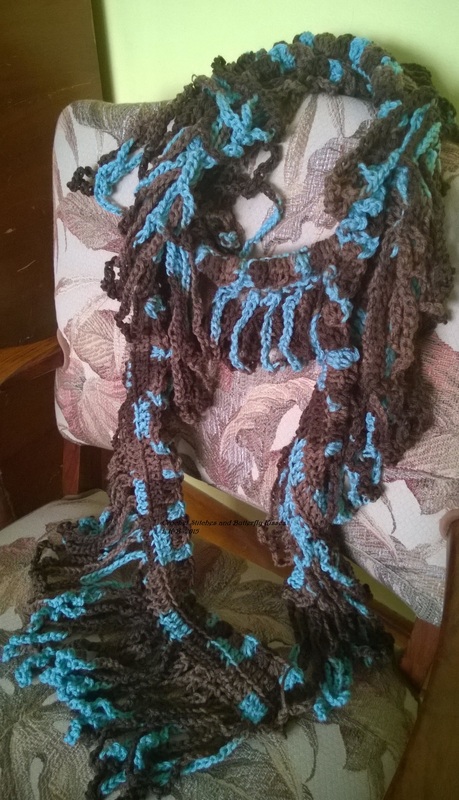 So I made ‘just one more’ scarf for myself. I made my hubby’s with Caron Simply Soft. It feels so silky and I love the texture that placing the stitches in the back gave this ripple pattern. I enjoy making scarves because .. well.. I love scarves! Also it gives me a chance to try out different stitches. And a scarf for me! The holidays are done and packed away. It’s time to make a new scarf or two for me! 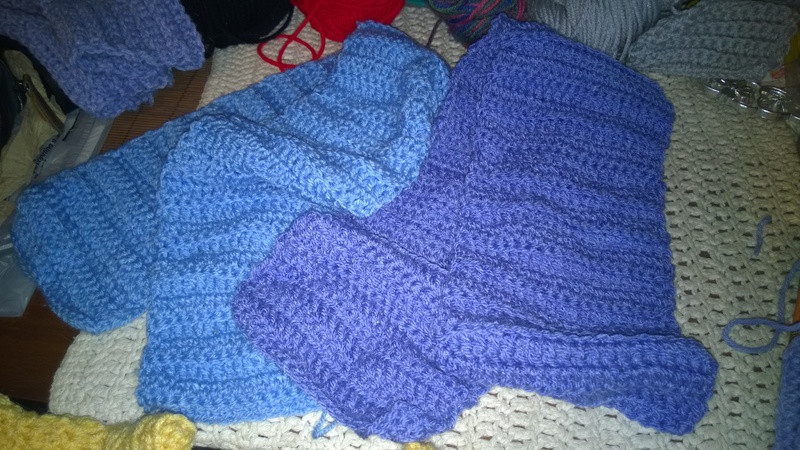 When I was Christmas shopping I found two beautiful yarns so I decided to make two scarves for my collection this year! 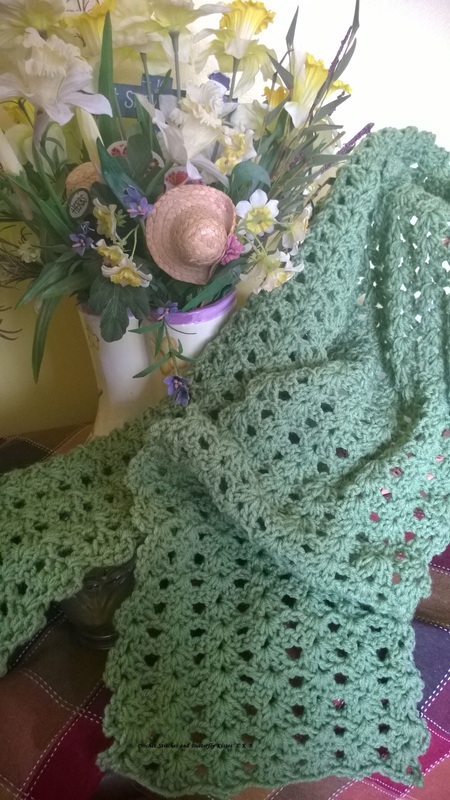 The one that I’m showing in this post is a Red Heart Yarn called Earth & Sky. I saw a few similar scarves on Pinterest. I really liked the tassel / fun of the design. 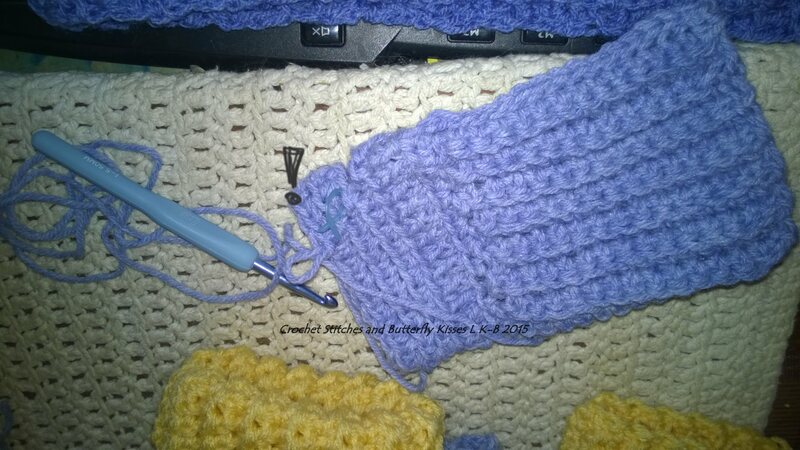 I decided to make it two long rows of double stitch for the ‘base’. Then for the tassel part I made the start of each single stitch strand at one stitch (of the base) then ended the strand at the stitch next to it. To finish off the ‘base’ (opposite side to the tassels) I made a row of puff stitches for texture.